a type of orthosis worn around the neck for support and stabilization. See also cervical orthosis. Chandler collar a neck brace made of soft felt. four poster collar a rigid brace with four upright rods to support the neck and reduce motion; it has chin and occipital supports. Philadelphia collar a rigid, adjustable neck brace. Philadelphia collar. From Dorland's, 2000. (kol'ăr), In most contexts, the phrase cervical collar is redundant. A band, usually denoting one encircling the neck. /col·lar/ (kol´er) an encircling band, generally around the neck. cervical collar see under orthosis. 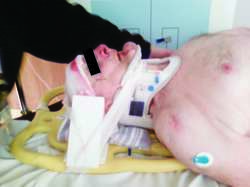 Philadelphia collar a type of cervical orthosis that restricts anterior-posterior cervical motion considerably but allows some normal rotation and lateral bending. any structure that encircles another, usually around its neck, such as the periosteal bone collars that form around the diaphyses of young bones. 1. A garment or part of a garment surrounding the neck. 3. A device used to limit motion or support the neck. 1. A band worn around the neck. 2. A structure or marking formed like a neckband. 3. A device designed to limit movement of the neck. A soft or rigid band of plastic or padded foam that is designed to limit extension, flexion, and lateral movement of the neck. Soft collars usually are reserved for confirmed strains of the neck. See: rigid cervical collar; cervical immobilization device; orthosis; Philadelphia collar for illus. 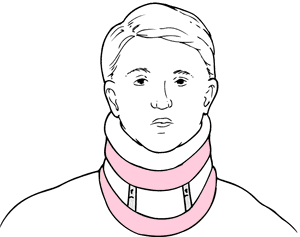 A firmly constructed, lightweight collar used to restrict cervical spine movement, e.g. during extrication of injured patients from motor vehicles. (kol'ăr) In most contexts, the phrase cervical collar is redundant. n the small part of the root of a tooth that is a part of an artificial tooth (denture). a decoration or harness worn around the neck. The primary means of restraint for domestic dogs. Used in cats as ornaments or to carry identification. See also elizabethan collar. friction sores caused by rubbing of a saddlery collar on a horse's shoulder. part of draft, cart or buggy harness. Made of leather, stuffed and lined with felt, they are fitted to the neck of the horse. They carry the metal hames to which plow chains or leather traces are attached. a rigid cylinder, usually fashioned from x-ray film, applied around the neck to prevent the animal or bird from turning around to traumatize parts of the body with their mouth or beak.